After all five of us have eaten an apple a day, and we’ve made gallons of applesauce, tray after tray of dried apple rings, yards of apple-based fruit leathers, and an apple pie—our fridge is still full of apples. So here’s a nice way to celebrate a fridge full of apples. Especially on a pancake day or when you have guests for breakfast over a long holiday weekend. Of course, I seem to recall from years past that these apples also make a fine dessert with a scoop of vanilla ice cream melting into them. Luckily, we have plenty of apples for me to re-confirm that for you sometime soon. 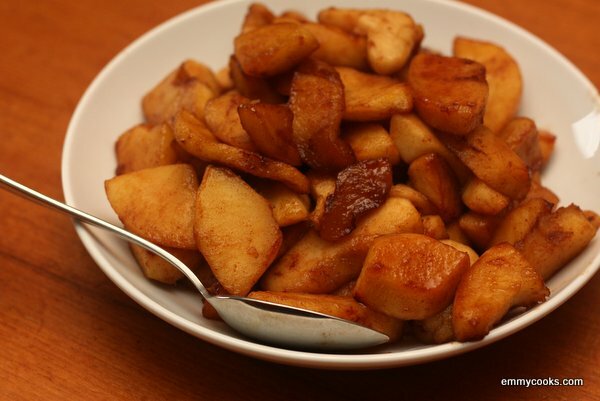 Caramelized Apples with Cinnamon: Peel and core a few apples and cut them into uniform slices, about ¼” thick at the widest part if you want them soft or about ½” thick if you want them to keep a bit of crunch. Melt a knob of butter over medium-high heat in your widest pan and slide in the apples (don’t pile them high in the pan, but they can be thicker than a single layer). Watch carefully as they cook, and use a thin metal spatula to scrape up the apples and turn them when golden-brown spots begin to appear. Continue to turn every couple of minutes, until the apples are golden-brown in many places. Add a Tbsp. or two of sugar and a few good shakes of cinnamon, then stir and taste. Add more sugar and/or cinnamon to taste and continue cooking for another minute or two, until the apples are well caramelized. This entry was posted in Breakfast, Desserts, Food, Fruit, Recipes and tagged apples, cinnamon, pancake topping on November 19, 2012 by emmycooks. Umm…why have I never thought of doing this?! They look absolutely delicious!! What kind of apples did you use? It’s like apple pie without the pie! Brilliant. I wonder if you could purée the apples and make apple pie sorbet? It really is. In fact, I thought it might be great with a little granola sprinkled on top–apple crumble for breakfast! This would also be perfect with a stirred custard over the top! I happen to love apples done this way. They are delicious! I’m not ambitious enough to attempt hard cider, but if you think about apples as the lemons you might use to make limoncello . . . I found these online, but I’m sure that with a little research, you can pull up more . . .